A nice thing about being retired is having more time to read. I’ve just completed two books, one of which I read for first time in college: “The Stranger,” or as it is titled in French, “L’Étranger,” by Albert Camus, published in 1942. My copy is a new translation in “American English” by Mathew Ward. Set in Algeria, the novel is just 120 pages long. 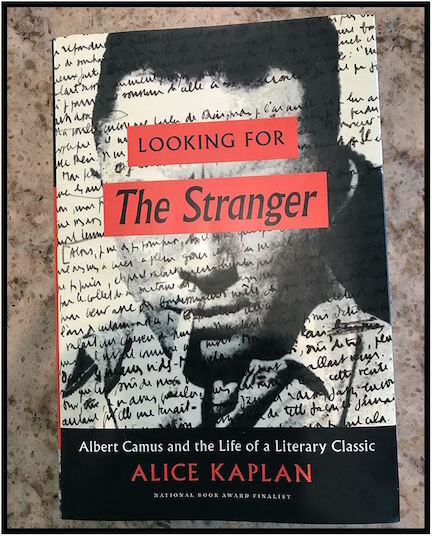 The second book was published last year: “Looking for The Stranger: Albert Camus and the Life of a Literary Classic” by Alice Kaplan. It’s both an excellent history of Camus’ life and of his most famous book. So what’s next on my bedside reading table? I’m going to dip back into “Swann in Love,” the novel within the novel of Marcel Proust’s gigantic “In Search of Lost Time.” Just 200 pages, unless I again become hooked and reread all 3,031 pages of the complete work. Don’t be a stranger Dave.